DIARY OF A PUBLIC SCHOOL TEACHER! : Student-Directed Learning:Giving Students the Rein! Student-Directed Learning:Giving Students the Rein! problems to fill a water tank. I would expect them to learn how to multiply the factors, and that would be enough. Whether or not they actually understood what volume was not an issue. All they needed to know was the formula. Fast forward to the year 2013, where I don't use that method to teach anymore. 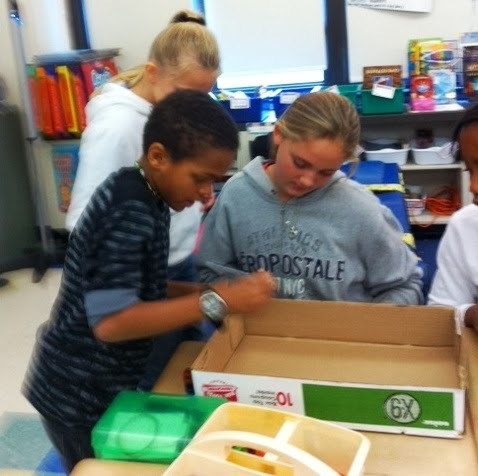 My learning is student-directed, they are required to problem-solve. Using cubes and containers, the day before, I got my students to understand what volume actually is. So, now how to get them to figure out the formula without the cubes. What to do? What to do? I gave them a box. A box lid and cubes. My directions? Find the volume of the lid without putting the cubes inside the container. I told them that I would love to hear the vocabulary we had learned in their discussions and then I let them loose! The results were amazing! I got out of the way and let them go. It was a joy to walk around the room, and immerse myself in the discussions they were having. The vocabulary we learned rolled off their tongues, and ideas of how to accomplish this task were shared, revised, and tried. They were engaged from the beginning to the end. In the end, every group was able to come up with the formula for volume! I was very proud of the work they had done. More and more, I have embraced this as my method of teaching. I have become a facilitator of learning, rather than the leader, the head honcho in charge. I am putting more control of the classroom in student hands, and I am enjoying the results! Wow! Imagine, actual thinking and learning going on in a classroom! I get excited about the potential future of education whenever I read this blog. Congratulations Lisa. No fill-in-the-dot test required with this kind of real learning! Kudos to you. As a retired teacher, I have seen this type of activity where we encourage the students' curiosity and intuition come and go with good teachers, as long as they are allowed the time to teach creatively. However, the ever present frequent standardized testing/assessment has recently taken over the classrooms and it has become difficult to find the time we need to allow the students to assimilate and internalize what they have discovered. "Music to My Ears!" AND a FREE GIVEAWAY! I Suffer from FOEA- Fear of Education Acronyms! Teach Them Like They're Future Presidents!